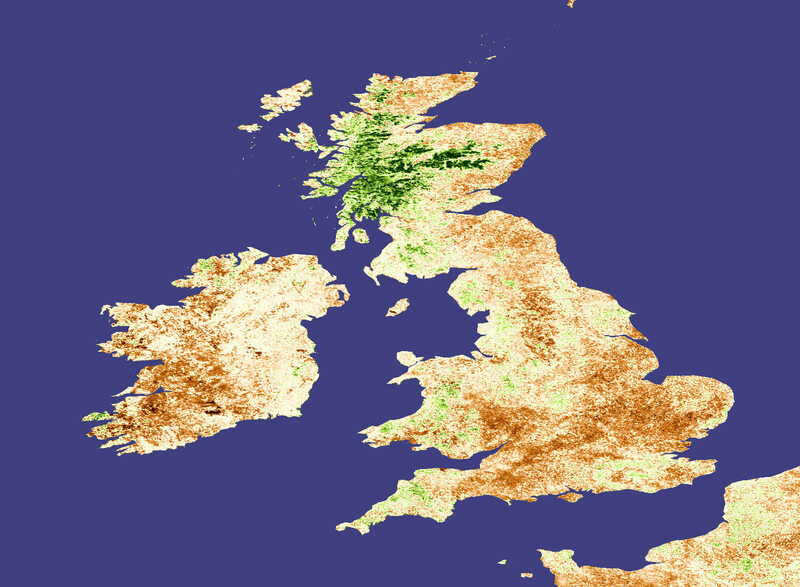 According to the United Kingdom (UK) meteorological office, 2003 has been one of the driest years on record. The UK escaped the blistering August heat endured by much of the rest of Western Europe, and dry weather actually aided the harvest pace and boosted crop quality. But now, continued dry weather has caused germination problems for major fall-seeded crops, such as rapeseed, barley and wheat. The planting window for winter rapeseed ended in September, and the UK National Farmer’s Union (NFU) reported that 30 percent of rapeseed fields had poor germination, and will need to be replanted with another winter crop (wheat or barley) this fall or a spring crop (rapeseed or barley) in 2004. The failure of the winter rapeseed crop may have a negative impact on birds and bees in the UK. Rapeseeds are a major component of the diet of many birds including linnets, turtle doves, and reed buntings. Bumble bees rely on winter rapeseed pollen. 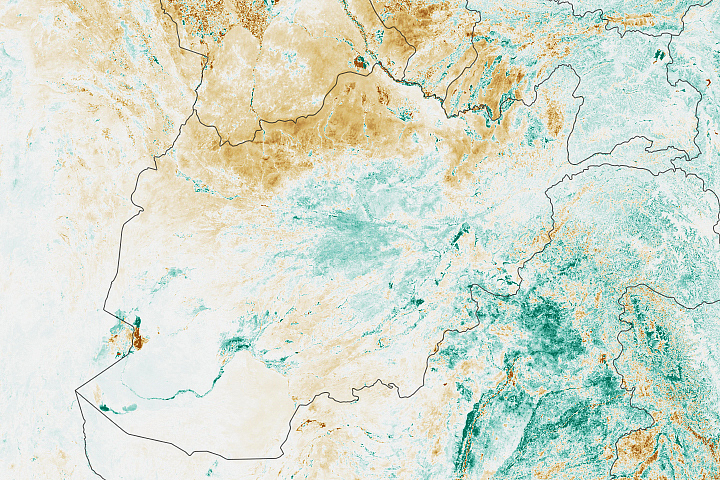 The crop’s failure is evident in this Normalized Difference Vegetation Index (NDVI) image made from data collected by the Moderate Resolution Imaging Spectroradiometer (MODIS) in 16-day increments between September 30 and November 16 in 2003 and 2002. 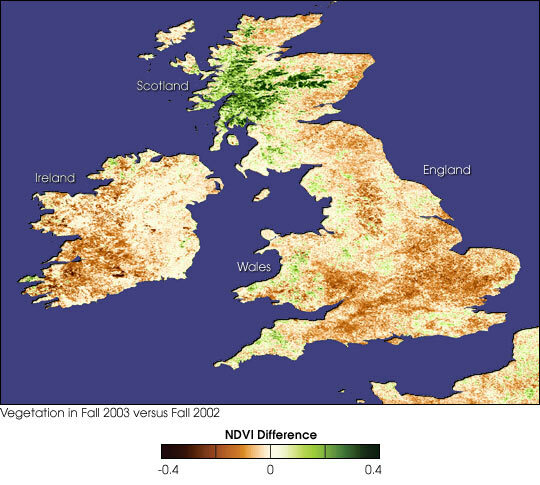 Brown patches across the UK show a decrease in vegetation (of all kinds) between fall 2003 and fall 2002, beige is no difference, and green is more vegetation. The southern reaches of England and the western shores of Ireland seem particularly hard-hit. Total rapeseed area in 2003 was a record— 550,000 hectares compared to the 430,000 hectares planted in 2002. Most of the area increase seemed to come at the expense of winter wheat, which decreased by 100,000 hectares. Now, farmers report that brown fields have taken the place of the green winter rapeseed crop. In November, widespread rains arrived in the UK, which should alleviate some of the drought pressure and allow some additional germination. The UK is a major crop producer for the European Union, and conditions there will continue to be monitored closely. 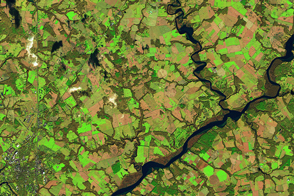 Image by Reto Stockli, based on MODIS NDVI data (16-day composites). Caption by Jim Tringe, Analyst for the Production Estimates and Crop Assessment Division of the USDA Foreign Agricultural Service.